I still remember that night when I was chitchatting with my friends. The conversation went on when we shared what signs we were asking from God if we’ve found our soulmates. Most of them had weird signs, while I kept it simple. However, after 7 failed relationships and countless dates, nobody has ever had the luck of completing that sign. Not even my 12 year old relationship hit the bullseye. That’s when I realize that God is probably reserving “the one” for me. I still remembered when my ex (the 12 year guy) gave me a surprise and I was quite disappointed since it was not the sign I asked for, I asked him why he gave me that surprise, he said he was planning to give me (that thing: the sign) but it was not available when he wanted to buy it. I was disappointed, hurt and was broken but I eventually realized that God really has better plans for me. So now, as I turn another chapter in my life I am still waiting for that person who can give me the sign. It’s like the movie “Serendipity” if you are meant to be, fate will bring you together and of course they do had some sort of magical sh*t in the movie. So for how long will I wait for my soulmate? For as long as God will finally show me the sign. I’ve waited for 16 years for this so there is no harm on trying to wait for another 2 or more years. Hahahaha! I know I’m such a child at heart believing in all this signs and all, but it wouldn’t hurt right? I know someday, Mr. 27 the one from my fortune will be holding that magical sign and it will be perfect. The moment will be just right. Someday. 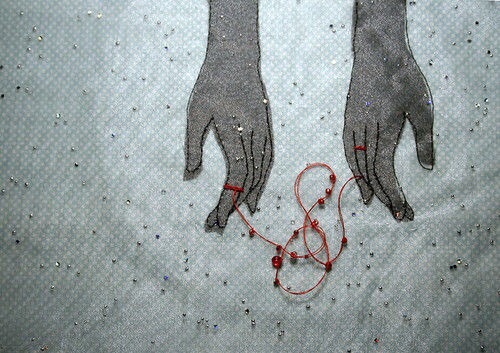 The two people connected by the red thread are destined lovers, regardless of time, place, or circumstances. This magical cord may stretch or tangle, but never break.